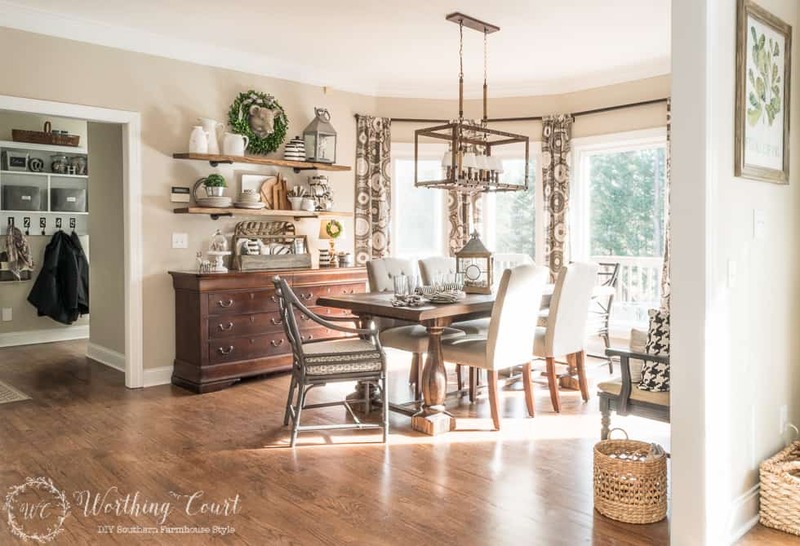 Once we completed the major remodeling projects in our new-to-us, twenty year old home, it took me a full year to get my breakfast area looking just the way that I wanted it to. I had several starts and stops and several fails along the way, but I can honestly say it was one of the most fun makeovers that I’ve ever completed. So – for this week’s “Best of Worthing Court”, I’d like to take a look back at that space and just how far it has come. This space includes several easy and affordable diy projects that you can copy and incorporate into your own home! 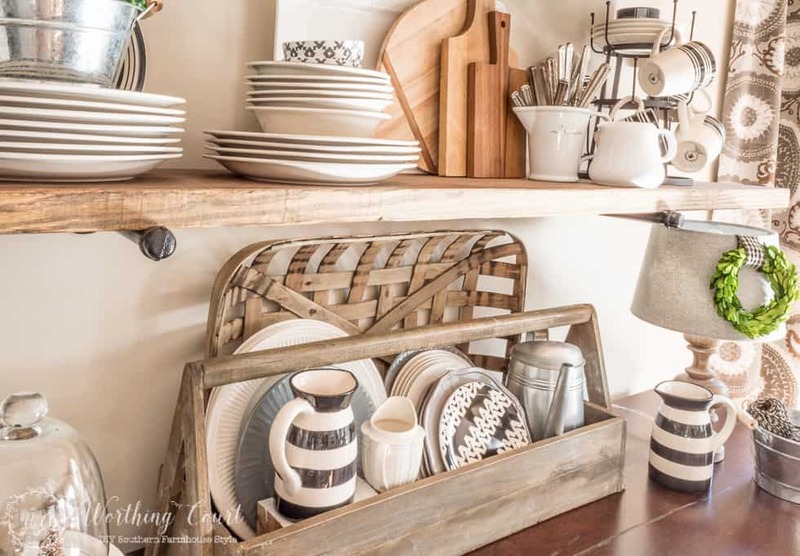 I shared when I came up with a kitchen and table linens storage solution, when I added a large printable above the bench (you can download a 9×11 copy of the printable HERE), when I made some changes to the gallery wall for fall, when I replaced the gallery wall with diy rustic industrial shelves and most recently was when I shared my Farmhouse Christmas Kitchen with you. But I wanted to come back today to take a closer look with all of the Christmas decorations removed and with the whole area pretty much back to normal. The first new addition to the breakfast area is an amazing new light fixture. 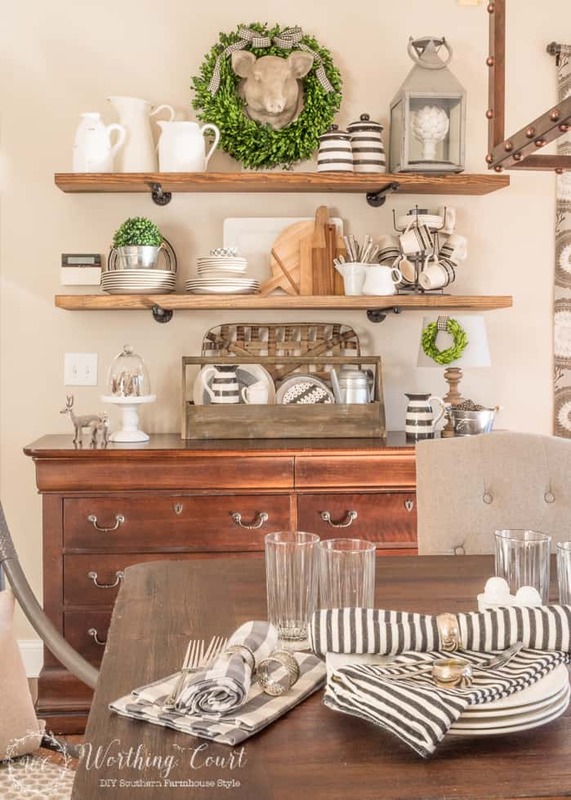 Have you ever added something to a room and then realized that it was just what the room needed? That was the case for me when this rustic/industrial beauty was installed. Oh, how I love it! 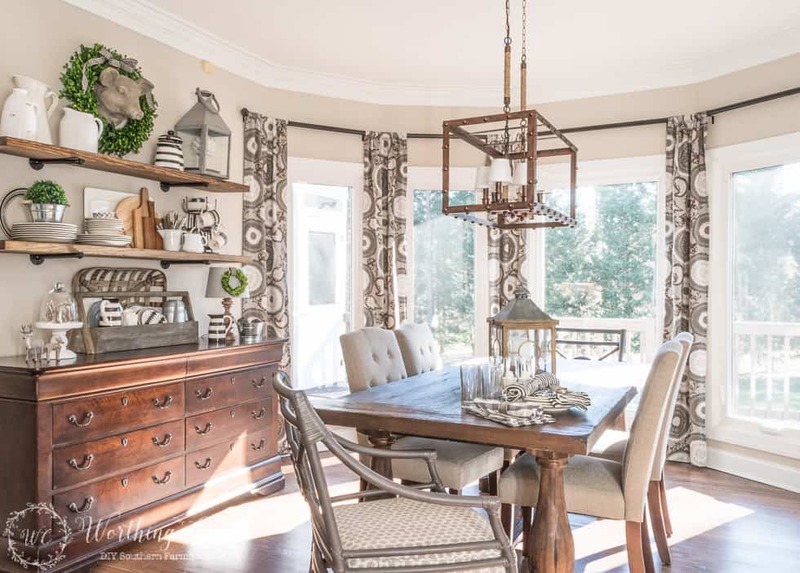 I’ve mentioned before, that our breakfast area sits in one of two turrets that are on the back of our house (the other is in our master bedroom). 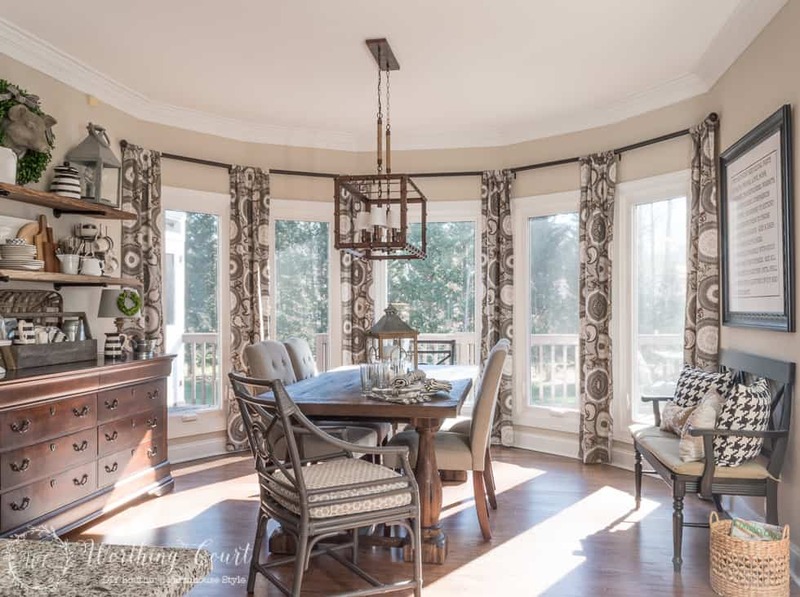 I love, love, love the panoramic view that it provides of our back yard, but it was a bit of a challenge to come up with window treatments that were a) affordable, b) easy to install and c) didn’t block any of the view. I always thought that I would go with diy faux roman shades on each of the windows, but decided that they wouldn’t be quite right in this space. My solution was an affordable, no-sew, drapery option. You can see how I put the whole window treatment together HERE. BTW, that’s the granite on the corner of the kitchen island that you see in the lower left corner in the photo. And here she is AFTER. Other than decorating the space, we replaced the vinyl flooring with hardwoods and painted the walls with Sherwin Williams Accessible Beige. Oh, and we replaced all five of the windows in the turret too. 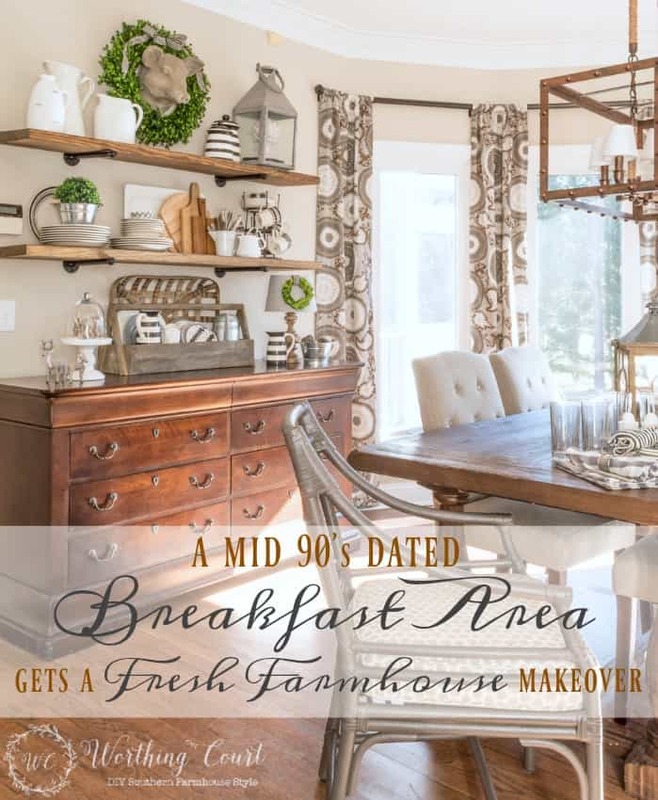 Your breakfast area is stunning! The drapes are beautiful. They add such a pretty pop of color. My favorite has to be the bench! Looks so lovely with the big print hanging over it. It was fun to see the before and after shot! What a huge transformation! Your breakfast area has come so far……great job. 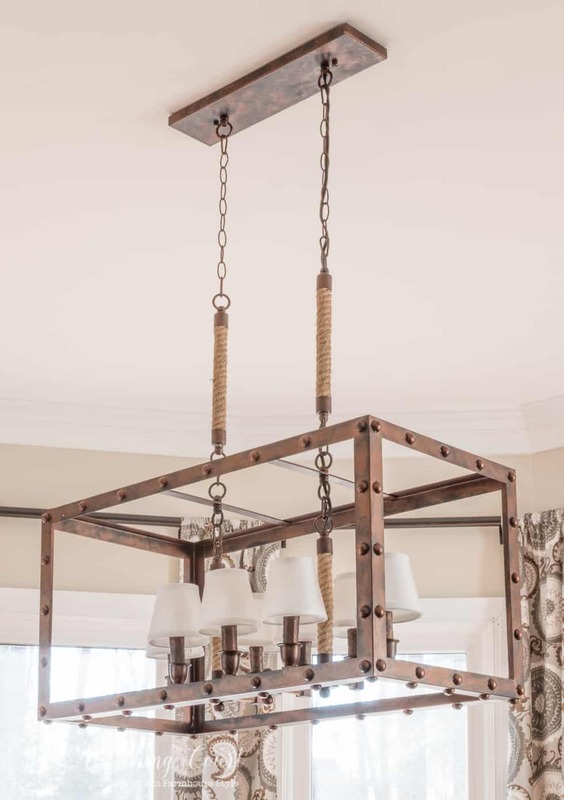 Love that light fixture!! 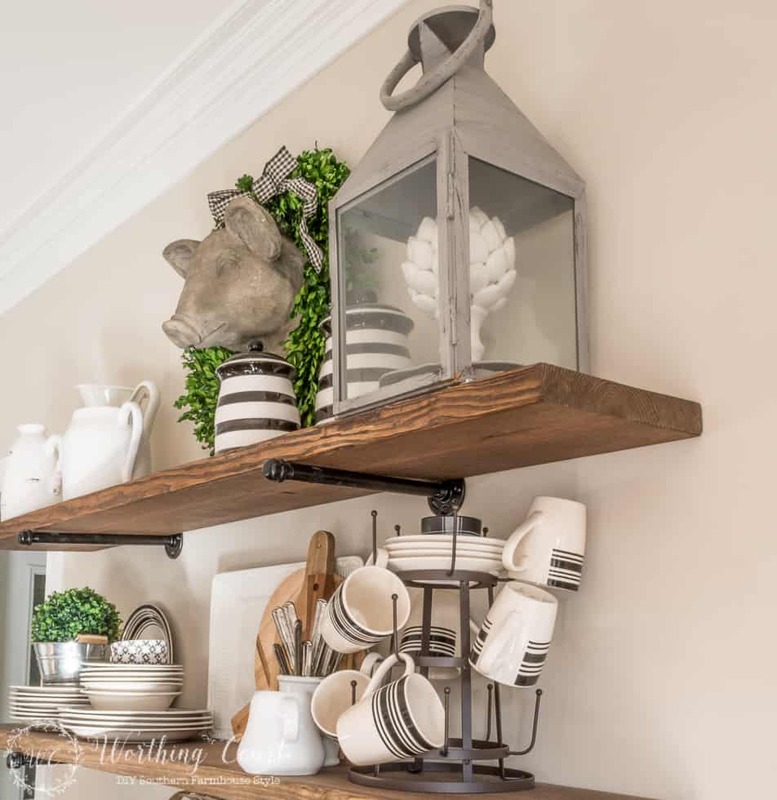 Your rustic shelves are a favorite of mine too and hope to make some of my own very soon. Love the room! Where did you get your dining table? Thanks! Such a beautiful breakfast room. Wow! What a transformation! Inspiring! Thank you! It all has come together & looks so great. I wished I had the view you have. Every things looks so beautiful. Enjoy! Love, love, love your home! The look of your breakfast room is almost ecaxtly what I am planning for our dining room when we redecorate this year. I love how your changes warmed up the space compared to the “before” photo. What a huge difference! Also, thanks for sharing the paint color you used. I am new to your blog and I always wonder about the paint color when I see a room that I like. What a great makeover. It now is warm and inviting. The before was cold and empty. 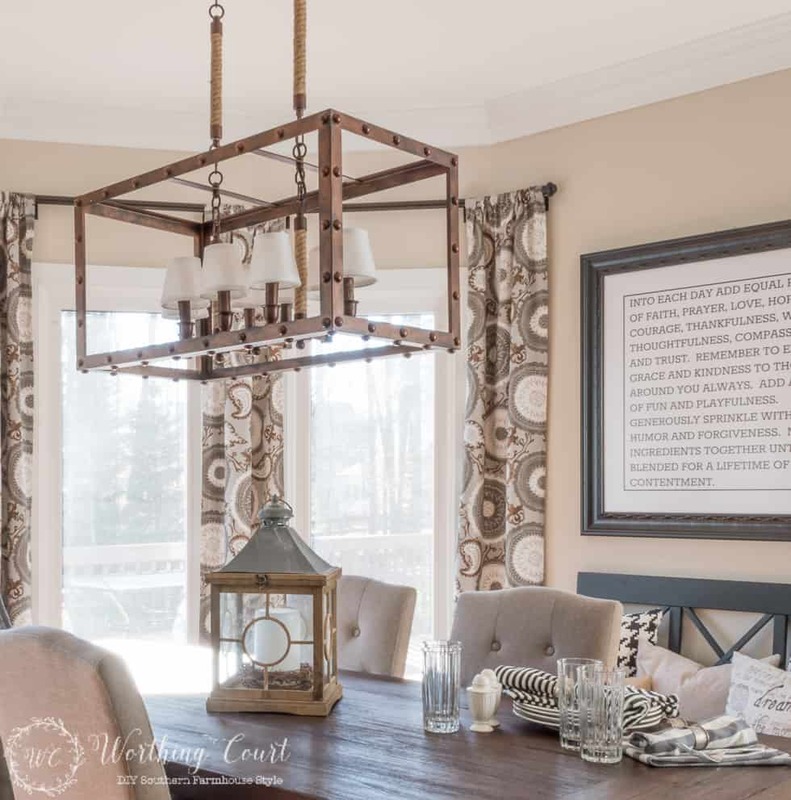 Your light fixture is perfect for your breakfast area. You did a fabulous job on your breakfast area!!! Love the before and after pictures. What a beautiful and inviting area! I always admire your style. Love the look! 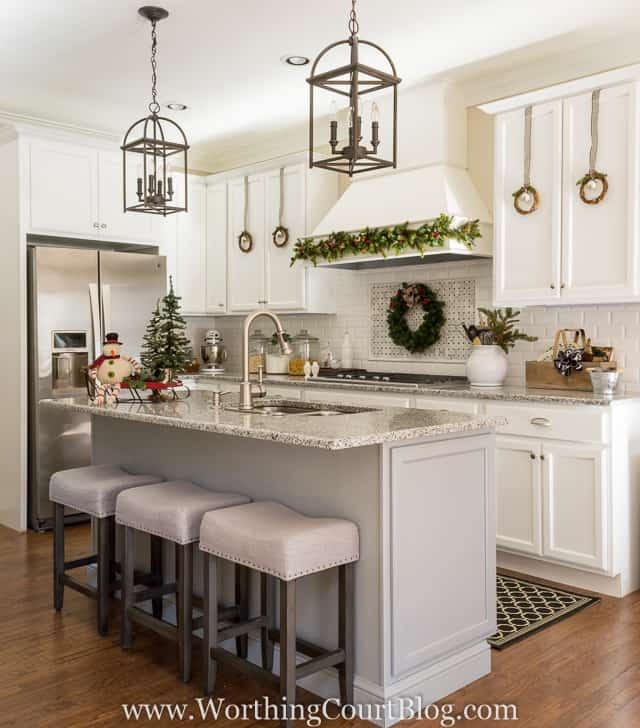 Where did you get your kitchen light fixtures?? 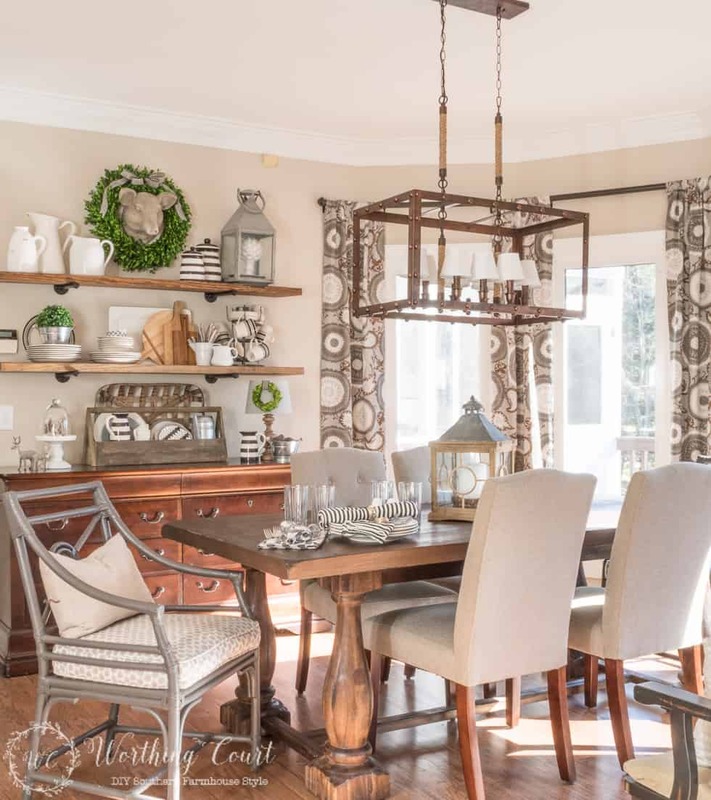 I love the way that you have decorated your dining room. Thanks also for providing a before picture. It makes it even easier to appreciate all of the changes that you and your husband have made. Such a warm and inviting space. I love the wood tones. You have used the available space in a much more inviting fashion – it looks like a totally different space! Love your kitchen! Lovely space, you did an amazing job. The chandy is spoon worthy for sure. Absolutely stunning transformation!! And I love the drapes!! This has to be one of my very favorite rooms! I love everything you’ve done and boy has it come a long way! Just beautiful. Your open shelving was part of the inspiration for my own open shelves! I love mine, too! 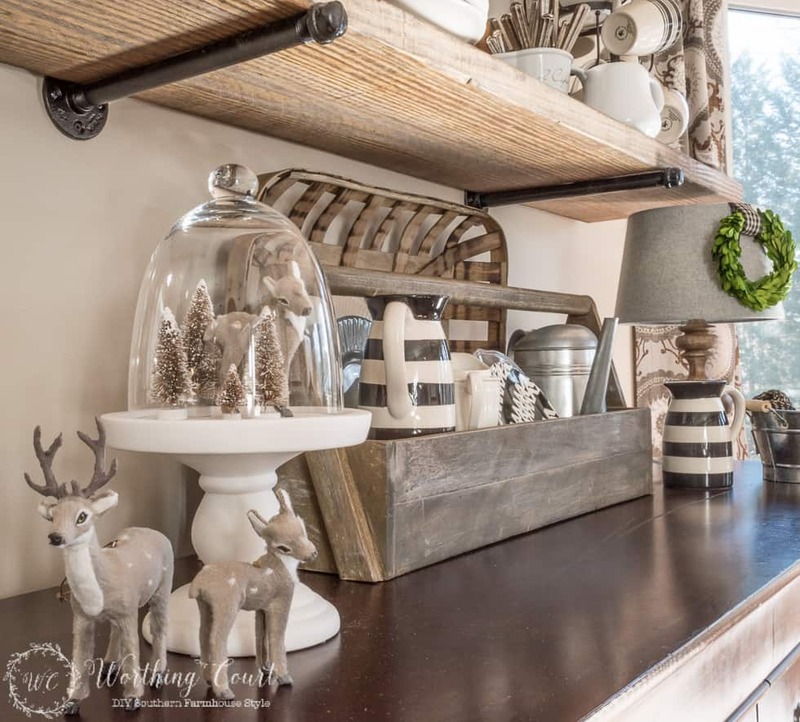 I just love all that you have done to make your home warm with the farmhouse style. Thanks for sharing your home. 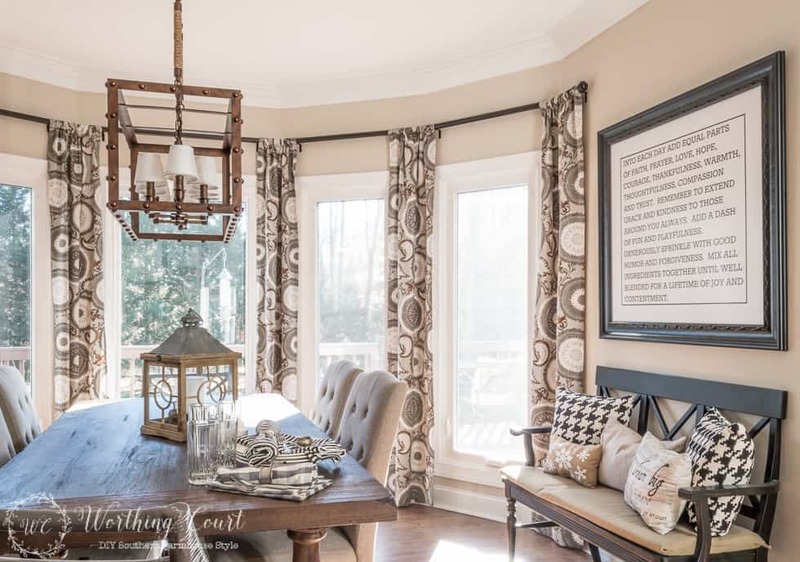 Can you tell us about the curtain rods for the windows in the breakfast nook ? Maybe a tutorial ? 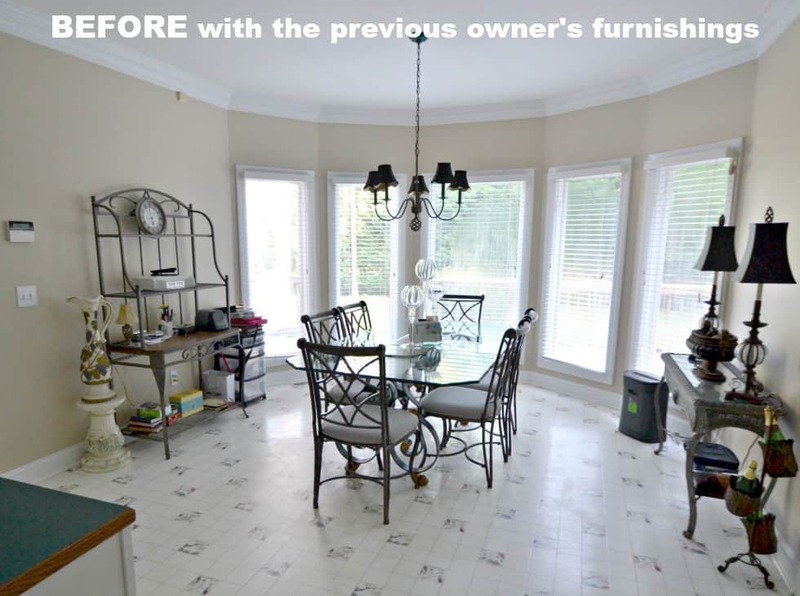 The before and after in this room is really amazing Good job. 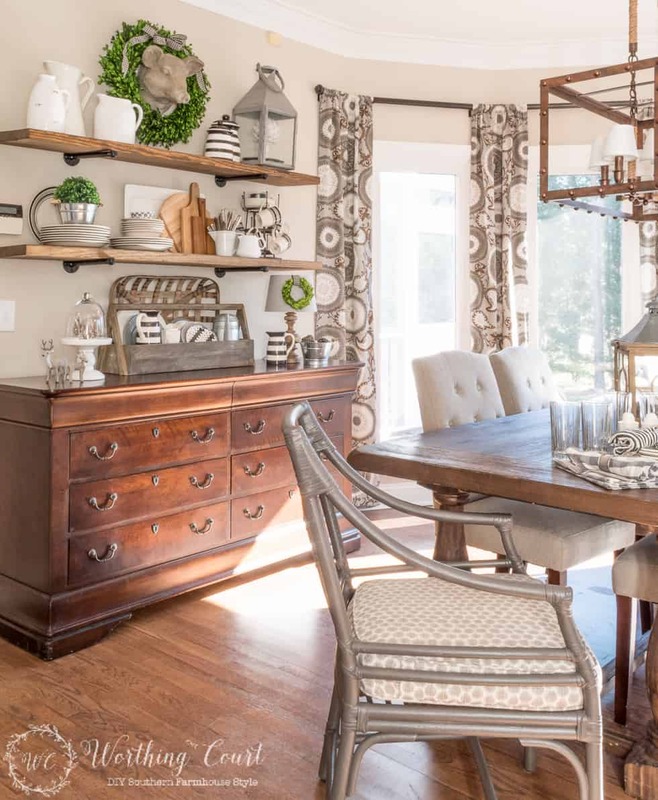 THE most gorgeous breakfast room on the net!! Yummy. Love the whole look. Very pretty. The difference from before to after is amazing. Your amazing touches, completely change the feel of the room. Wowza, the fact that you can see beyond what the previous owners had done is proof you should be blogging. I think I’d heard only 15% of people can see beyond paint, furniture placement, clutter, etc. Everything is amazing!